The Projector is Red River College’s bi-weekly newspaper. I am a beat reporter for the arts and culture section. “Prepare to Explore the Nuit” Article about Nuit Blanche, September 15, 2014. “Let Culture Days Reignite Your Passions” Article about Culture Days, September 15, 2014. “Loving Yourself One Selfie at a Time” Article about the #HEARTeveryBODY Project at the Women’s Health Clinic, September 2, 2014. “Playing with Power” Article about FemFest, September 2, 2014. “Small Festival, Big Heart” Article about Rainbow Trout Music Festival, April 22, 2014. “Prouder than Ever” Article about the Winnipeg Pride Festival, April 22, 2014. “Cre-Comedian” Article about Jordan Welwood, a RRC student and professional comedian, April 7, 2014. “Simple Threads” Article about Normandy Shop, April 7, 2014. “Arts Briefs” March 9, 2014. “The Art of Branding” Review of the Cannes Lions International Festival of Creativity, December 2, 2013. “Student Mental Health High on RRCSA’s List” Article about the Canadian Alliance of Student Associations, November 4, 2013. “Made in Manitoba” Article about Market Burger, October 7, 2013. “Arts Briefs” September 23, 2013. 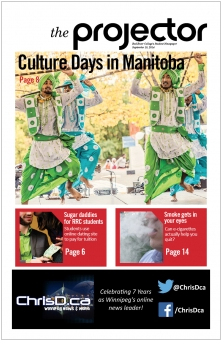 The Uniter is the University of Winnipeg’s weekly newspaper. I wrote articles and briefs for the news section. “Following Their Hearts” Article about indie-folk band The Head and The Heart, June 27, 2012. “The Festival is About Discovery” Article about the Winnipeg Folk Festival, June 27, 2012. “Why Don’t We Paint the Town and all that Jazz” Article about the TD International Winnipeg Jazz Festival, May 30, 2012. “International News Briefs” March 21, 2012. “International News Briefs” March 14, 2012. “International News Briefs” March 7, 2012. “International News Briefs” February 8, 2012. “The Uniter 30” Profiles of Matt Opalko and Vinay Iyer for the annual roundup of 30 impressive people under 30, November 30, 2011. “What if it doesn’t get better?” Article about the It Gets Better Project, November 10, 2011. “International News Briefs” November 23, 2011. “International News Briefs” November 17, 2011.